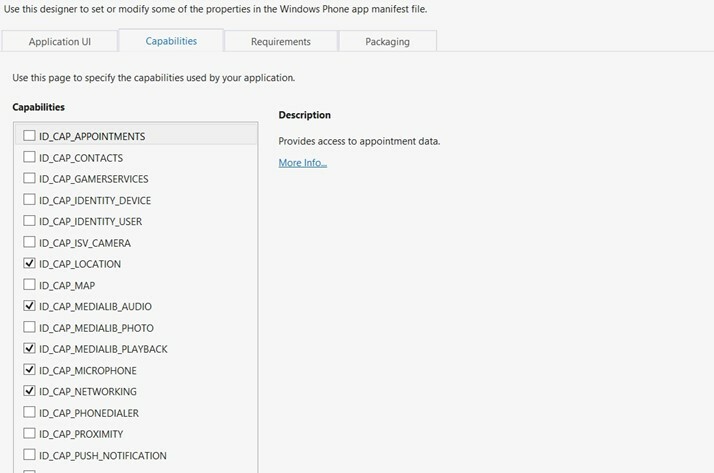 What is the Use of Capabilities in the Windows Phone App? Below are some of the reasons why we need to set the capabilities for the App. 1. When the user downloads and installs the Windows Phone app, it is necessary for the user to know about phone’s resources that the app uses. These could be microphone, network, camera etc. . . . The capabilities does exactly that. It provides an information to the user what the app can do and which phone functionalities the app uses when the user tries to download the app. These are displayed when the user is about to download and install. Now, the user can decide if he needs to download and install the app based on the Phone functionalities that the app used. 2. When the Windows Phone App is submitted to the Windows Phone store, the XAP (deployment) file will be decompressed and validated. The capabilities of the app is determined at this stage and written back to the manifest file during repackaging. 3. During the development, the developer can remove the unnecessary capabilities and include only the ones that are used by the App so that the capabilities that are not used can be avoided. By this , the developer is sure of what capabilities the app uses as well . There is an exception (different rule) in setting the capabilities for the Networking and Front Facing Camera though. 4. When the Capabilities are not defined in your Windows Phone App and when the App tries to access these API, you might get the “Access denied message” and then the app may exit unexpectedly. Well Nokia is now encouraging windows app development.. I recently came across a link to their new developers program which goes by the name of DVLUP, and is basically fr windows app developers & Students..
DVLUP program gives points and rewards to Windows Phone developers, bt interestingly this reward program is partly a game where you can compete with your peers, and maybe even meet some folks to collaborate with. As a player, you can earn badges for your accomplishments. Complete challenges and develop applications, you’ll begin to earn XP points (experience points) which you can redeem the XP for valuable rewards…. You can redeem these points in the Rewards Store for everything from Bluetooth stereo headsets to cool Nokia Lumia handsets to Nokia Premium developer account. This type of step from Nokia is not only better fr Microsoft to stay in the mobile market game but also very useful fr the mobile app development students.. Right now, there are a lot of resources available online to help with Windows Phone development from a technical perspective nd with this program students can earn exciting rewards & compete with others, and maybe even meet some folks to collaborate with….